Bob Corker couldn’t get himself to say it. 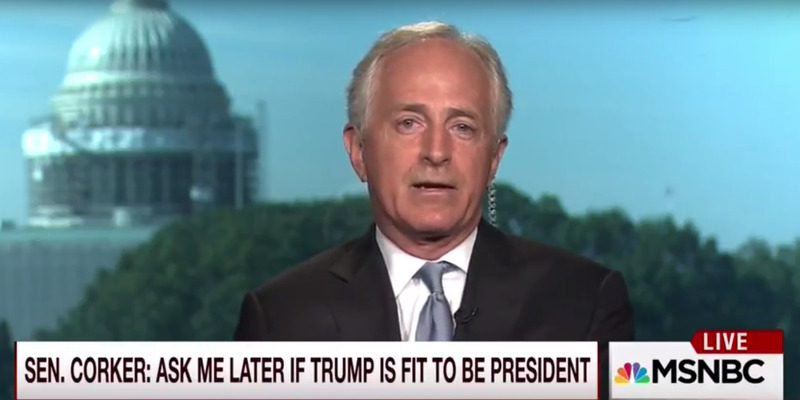 During a Tuesday interview with MSNBC’s “Morning Joe,” Corker, a Tennessee senator who is a top-ranking Trump supporter and has been listed as a potential running mate, refused to answer on three occassions whether the Manhattan billionaire was fit to be president. He added that it’s time for Trump to pivot from the primary and become a general election candidate. “This is a very important time for him, it is a very important time for our nation, and you know, it is up to him and I’m going to encourage him with every cell in my body until I see maybe he doesn’t take advantage of this,” he said when asked by Brzezinski about Trump’s fitness for the presidency a second time. The senator, who recently visited Trump at his Trump Tower home in midtown Manhattan, condemned the attacks Trump has made about US District Court Judge Gonzalo Curiel. Trump has attacked Curiel, alleging the judge has been impartial in a case he’s presiding over regarding the real estate magnate’s now-defunct Trump University on the basis of his Mexican heritage. Republicans from all sides of the party have criticised Trump for his remarks, but Trump has refused to change his tone. Corker first addressed the attacks during a Sunday interview with ABC’s George Stephanopoulos on “This Week” and said he condoned them but would not say anything further when pressed. “I’m going to continue to encourage until it’s too late,” he added.